Experimental or in-silico properties attached to the molecules like IC50, MW, logP, among many others, are easily used to color, search and cluster the molecules. Each molecule can be annotated. Using EyeMol doesn’t require molecular modeling knowledge, making it an ideal tool for chemists and project managers. Global vision of a dataset. All molecules are visible at once ! 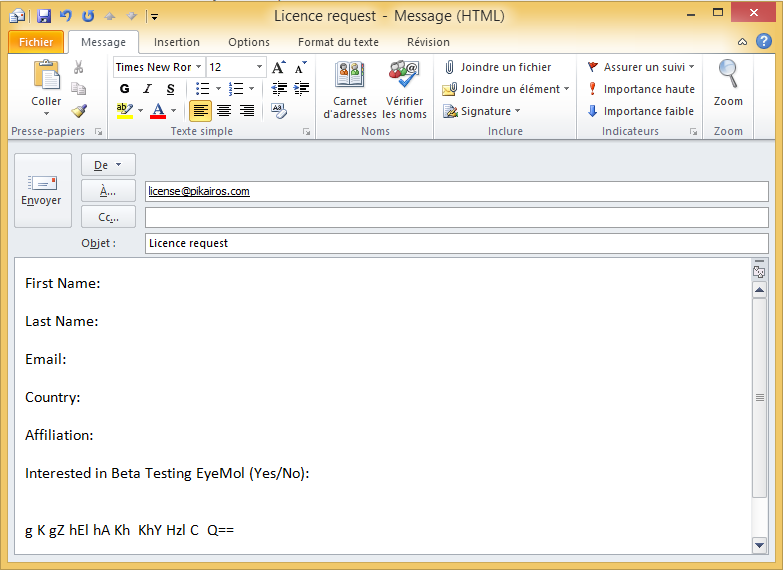 For the time being, we are only distributing EyeMol in its Windows version. Please get in touch through our contact page, should you need a Linux version. We will be happy to help on this. Please fill carefully the different fields. The complex code at the end of the email allows us to uniquely identify your computer in order to generate a unique licence activation key tied to it. If you need to activate several EyeMol licences, please repeat this protocol as many times as needed. In return of your email, we will send you a licence file called machine.lic that you need to store in the same directory as EyeMol. We are here to help you during the learning phase of EyeMol and for any question arising during the every day use too. Should you like to know more about EyeMol, please get in touch through the contact page. 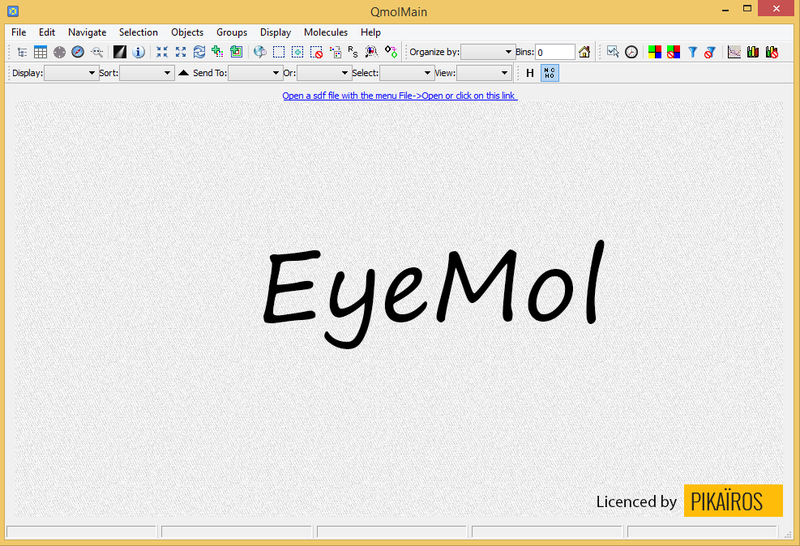 Click here to visit EyeMol text and video tutorials ! This SOFTWARE PRODUCT is protected by copyright laws and international copyright treaties, as well as other intellectual property laws and treaties. This SOFTWARE PRODUCT is licensed, not sold. End User License Agreement This End User License Agreement (“EULA”) is a legal agreement between you (either an individual or a single entity) and Pikaïros with regard to the copyrighted Software EyeMol (herein referred to as “SOFTWARE PRODUCT” or “SOFTWARE”) provided with this EULA. The SOFTWARE PRODUCT includes computer software, the associated media, any printed materials, and any “online” or electronic documentation. Use of any software and related documentation (“Software”) provided to you by Pikaïros in whatever form or media, will constitute your acceptance of these terms, unless separate terms are provided by the software supplier, in which case certain additional or different terms may apply. If you do not agree with the terms of this EULA, do not download, install, copy or use the Software. By installing, copying or otherwise using the SOFTWARE PRODUCT, you agree to be bound by the terms of this EULA. If you do not agree to the terms of this EULA, Pikaïros is unwilling to license the SOFTWARE PRODUCT to you. This Software is available for license solely to SOFTWARE owners, with no right of duplication or further distribution, licensing, or sub-licensing. IF YOU DO NOT OWN THE SOFTWARE, THEN DO NOT DOWNLOAD, INSTALL, COPY OR USE THE SOFTWARE. Pikaïros grants to you a personal, non-transferable and non-exclusive right to use the copy of the Software provided with this EULA. You agree you will not copy the Software except as necessary to use it on a single computer. You agree that you may not copy the written materials accompanying the Software. Modifying, translating, renting, copying, transferring or assigning all or part of the Software, or any rights granted hereunder, to any other persons and removing any proprietary notices, labels or marks from the Software is strictly prohibited. Furthermore, you hereby agree not to create derivative works based on the Software. You may not transfer this Software. The Software is licensed, not sold. You acknowledge that no title to the intellectual property in the Software is transferred to you. You further acknowledge that title and full ownership rights to the Software will remain the exclusive property of Pikaïros and/or its suppliers, and you will not acquire any rights to the Software, except as expressly set forth above. All copies of the Software will contain the same proprietary notices as contained in or on the Software. All title and copyrights in and to the SOFTWARE PRODUCT (including but not limited to any images, photographs, animations, video, audio, music, text and “applets,” incorporated into the SOFTWARE PRODUCT), the accompanying printed materials, and any copies of the SOFTWARE PRODUCT, are owned by Pikaïros or its suppliers. The SOFTWARE PRODUCT is protected by copyright laws and international treaty provisions. You may not copy the printed materials accompanying the SOFTWARE PRODUCT. You agree that you will not attempt, and if you are a corporation, you will use your best efforts to prevent your employees and contractors from attempting to reverse compile, modify, translate or disassemble the Software in whole or in part. Any failure to comply with the above or any other terms and conditions contained herein will result in the automatic termination of this license and the reversion of the rights granted hereunder to Pikaïros. The Software is provided “AS IS” without warranty of any kind. Pikaïros and its suppliers disclaim and make no express or implied warranties and specifically disclaim the warranties of merchantability, fitness for a particular purpose and non-infringement of third-party rights. The entire risk as to the quality and performance of the Software is with you. Neither Pikaïros nor its suppliers warrant that the functions contained in the Software will meet your requirements or that the operation of the Software will be uninterrupted or error-free. Pikaïros IS NOT OBLIGATED TO PROVIDE ANY UPDATES TO THE SOFTWARE. Pikaïros’s entire liability and your exclusive remedy under this EULA shall not exceed the price paid for the Software, if any. In no event shall Pikaïros or its suppliers be liable to you for any consequential, special, incidental or indirect damages of any kind arising out of the use or inability to use the software, even if Pikaïros or its supplier has been advised of the possibility of such damages, or any claim by a third party. Product support for the SOFTWARE PRODUCT IS provided by Pikaïros. For product support, please call Pikaïros. Should you have any questions concerning this, please refer to the address provided in the documentation. 10. No Liability for Consequential Damages. In no event shall Pikaïros or its suppliers be liable for any damages whatsoever (including, without limitation, incidental, direct, indirect special and consequential damages, damages for loss of business profits, business interruption, loss of business information, or other pecuniary loss) arising out of the use or inability to use this Pikaïros product, even if Pikaïros has been advised of the possibility of such damages. Because some states/countries do not allow the exclusion or limitation of liability for consequential or incidental damages, the above limitation may not apply to you. If you distribute the Software in violation of this Agreement, you agree to indemnify, hold harmless and defend Pikaïros and its suppliers from and against any claims or lawsuits, including attorney’s fees that arise or result from the use or distribution of the Software in violation of this Agreement.